With the “Mobile Friendly” update of Avril 21, 2015, you know Google favors the ranking of mobile compatible websites in search results on smartphones. If for you, mobile represents a significant part of your traffic and/or of your turnover (check Analytics), it might be interesting to track the positions of your keywords (and of your competitors) on this device. You will have two possibilities to track your keywords on mobile. 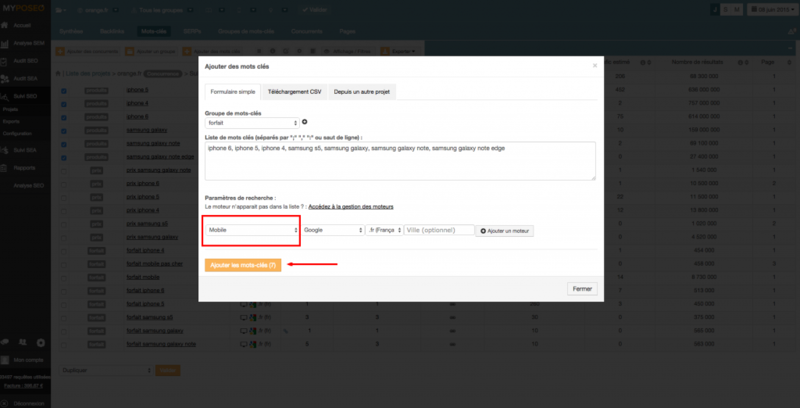 You will not need to re-create a campaign tracking if you would like to monitor the mobile positions of keywords already monitor on a classical campaign on desktop. 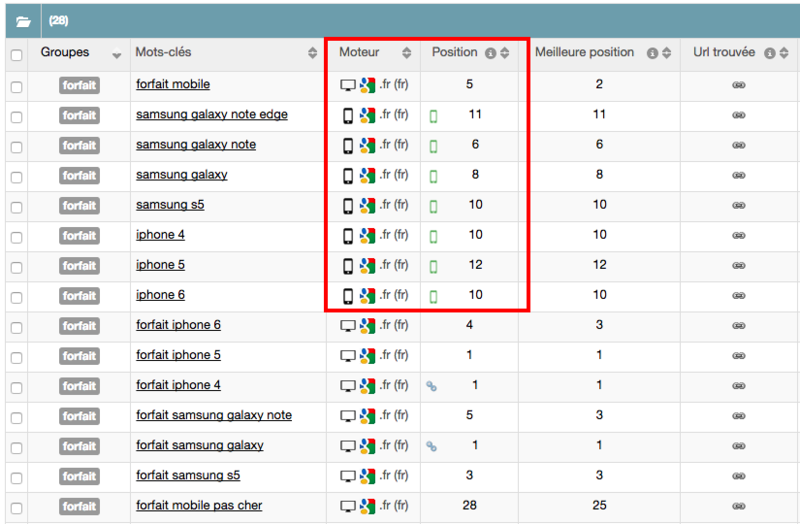 Select the project containing the keywords you want to have the mobile positions and go on the “keywords” tab. Once you have selected the keywords, go at the bottom of the page to the “action” box. Select “Duplicate” and confirm. A new window will appear detailing keywords to be duplicated. In search parameters, select the Mobile device and click on the “Add keywords” button. 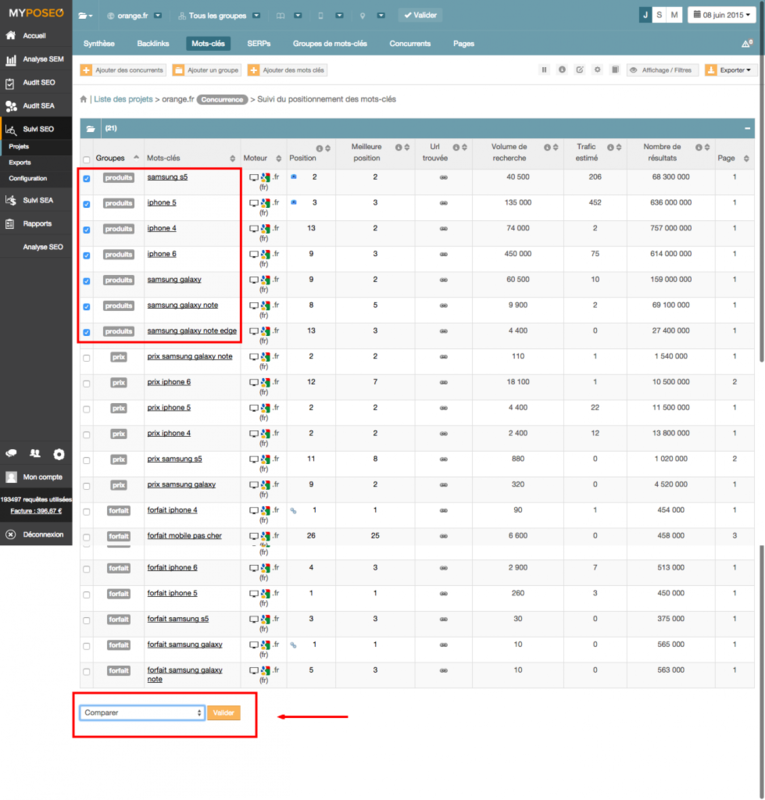 Note that the number of duplicate keywords will add up to your consumption. Here is an example, 7 keywords are added, so your consumption will increase by 7 keywords. After validation of adding keywords, calculation of the position of those keywords is performed in real time. To compare your desktop and mobile positions, click on the “Terminal” tab. When you are creating a SEO campaign tracking, you have the possibility to choose your terminals, mobile or desktop or both. Go to settings to inform about these specifications of monitor or audit. Once you have clicked on the “Add a project” button , the tool selects desktop as default device. Click on the “Add device” button. , choose “Mobile“. Then confirm the project. 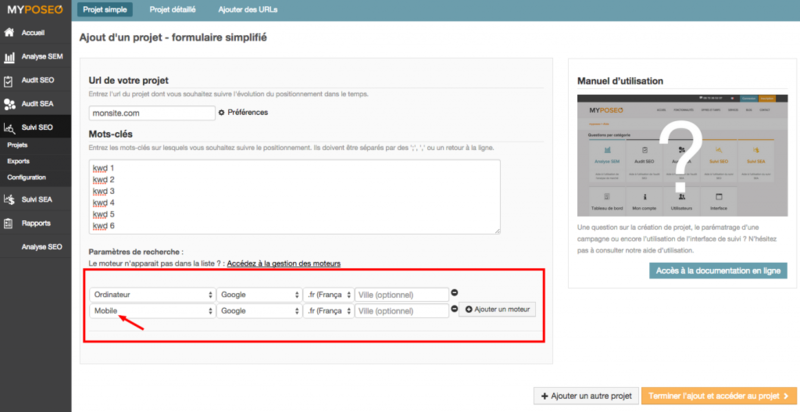 Note that calculation of the SEO positions multi-devices is available for our SEA tracking tool (Adwords) and for our SEO & SEA audit tools.